This Jello poke cake is a fun, classic recipe that is light and tasty! It’s a colorful cake inside with a light frosting. Perfect for rainbow parties or any get-together! 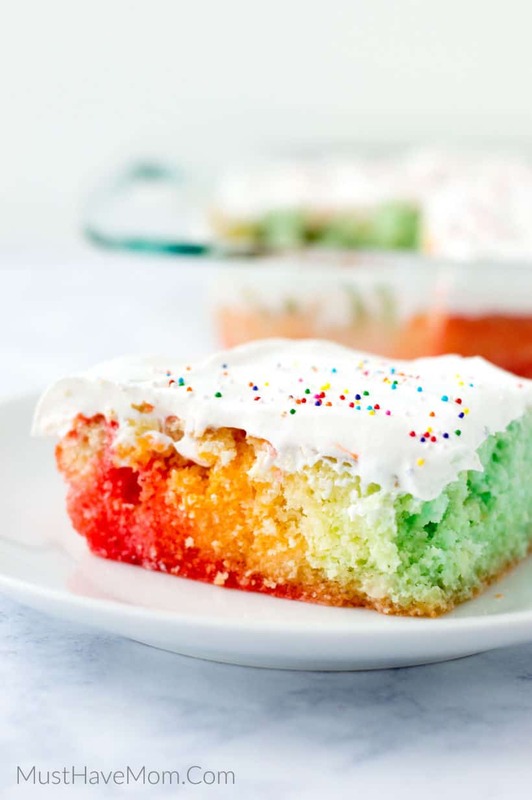 This rainbow jello poke cake is a spin on the classic poke cake. Poke cake has been around forever and for good reason. This cake is super tasty and it’s light enough that you can eat a whole slice (or two) without feeling weighed down after! 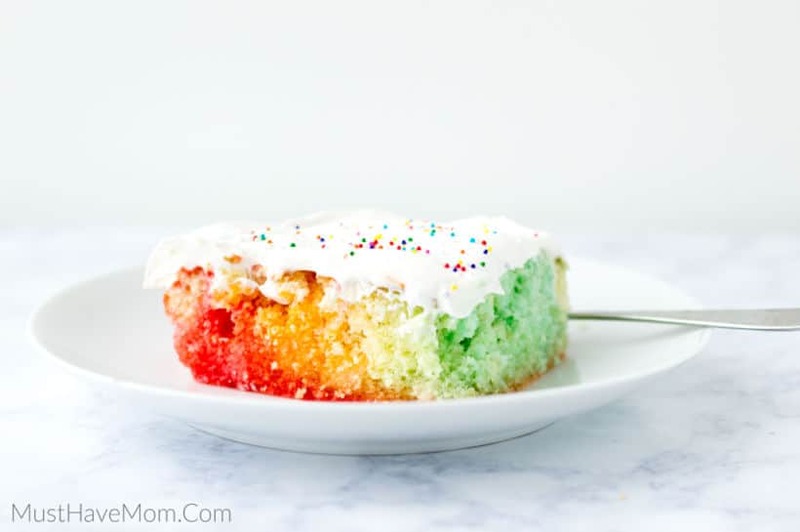 This rainbow cake is perfect for a rainbow party too! If you are planning a rainbow party then we have all the rainbow food you need! 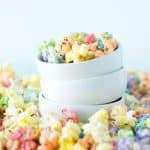 Check out this rainbow popcorn recipe, rainbow jello frosted grapes, layered rainbow jello and this ultimate guide to throwing a rainbow party! 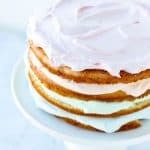 Making a poke cake is easy! You’ll start with a box cake mix, some Jello and Cool Whip. You’ll simply be making the cake and then poking holes in it for the Jello mix. You do not need to be a great baker to make this recipe and it’s an ideal recipe for kids who love baking! Begin by baking the cake as directed on the box, using a 9×13 pan. Allow it to cool for one hour. Use the end of a wooden spoon to poke holes all around the top of the cake. To achieve a rainbow in every slice space holes about ½” apart. Bring 6 cups of water to a boil. Divide into 6 equal portions and add 1 Jello mix to each cup of boiling water. Stir until the Jello has completely dissolved. Add 1/8 cup of cold water to each cup of boiling water and stir together. Carefully pour each color over the cake. Be careful to keep the colors separate so they don’t mix by pouring one color at a time in rows of holes and then do the next color. Using a squeeze bottle helps control where it goes. You may have liquid leftover, that’s okay. Chill at least 3 hours or overnight in the fridge. If you are in a hurry, put the poke cake in the freezer for half an hour instead! Next, frost the cake with Cool Whip frosting and add rainbow sprinkles. Store any leftover poke cake covered in the fridge when not serving it. It will last several days! Using a covered cake pan like this makes it really easy to cover this cake and store it in the fridge without the frosting sticking to plastic wrap or anything. 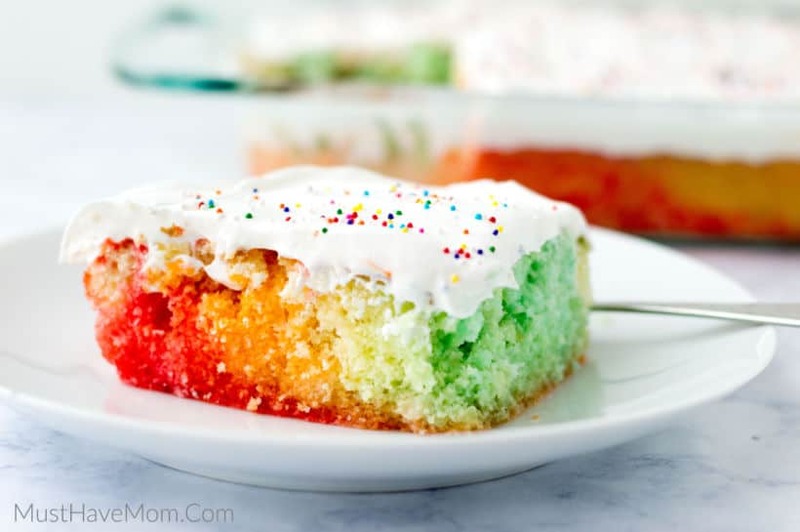 When you slice the rainbow Jello poke cake you’ll see the beautiful rainbow colors emerge! 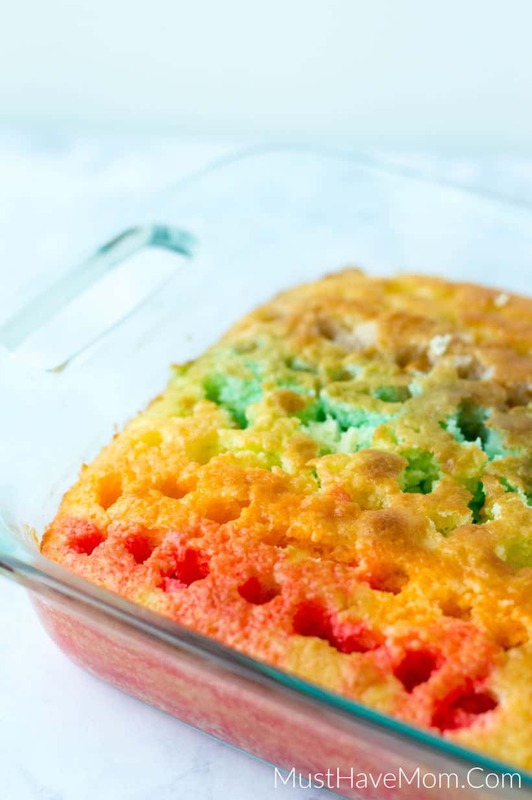 This rainbow Jello poke cake is a classic recipe that has been around for a long time. 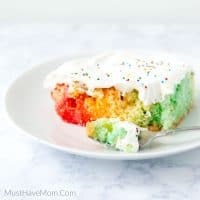 It makes a perfect rainbow cake for any rainbow party and the flavors can be switched up in an endless variety of ways! Begin by baking the cake as directed on the box, using a 9x13 pan. Allow it to cool for one hour. Use the end of a wooden spoon to poke holes all around the top of the cake. To achieve a rainbow in every slice space holes about ½” apart. 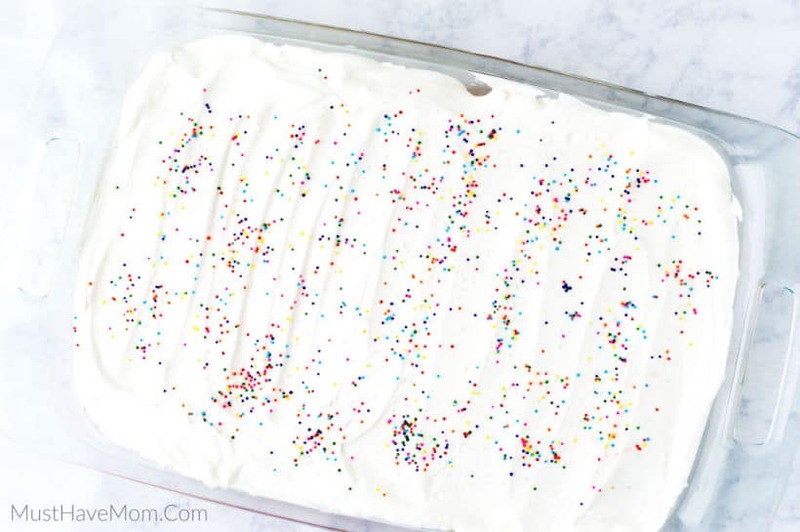 Frost the cake with Cool Whip frosting and add rainbow sprinkles. Store any leftovers in a covered container in the fridge. Cake will last for several days. Change Up The Flavors In Your Poke Cake - You can make this poke cake recipe with any different flavors! 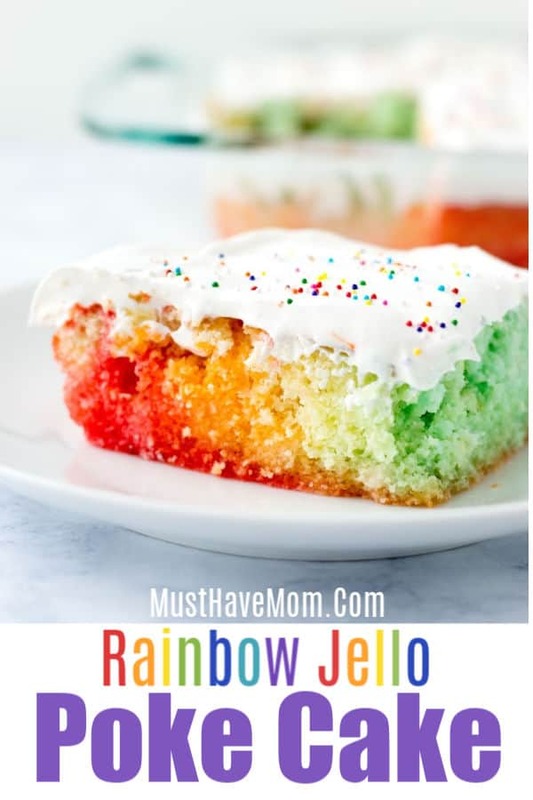 Use any kind of cake mix and Jello flavors to change it up. You could try a chocolate cake with cherry Jello or a funfetti cake mix with blue raspberry Jello. The possibilities are endless! You can also use a strawberry sauce or any kind of fruit sauce in place of the Jello. Other Frosting Options - There are other ways to frost your Jello poke cake too! You can mix a 3 oz box of any flavor Jello into the Cool Whip to flavor and color the frosting. You could also add prepared vanilla pudding whipped into the Cool Whip and then frost the cake. Can You Make a Gluten-Free Poke Cake? - Yes! You can make a gluten-free poke cake using this recipe. Just replace the box cake mix with a gluten-free box cake mix like Betty Crocker gluten-free cake mix. Use fruit sauce in place of Jello if desired and top with fresh whipped topping. You can make this poke cake recipe with any different flavors! 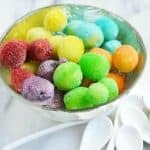 Use any kind of cake mix and Jello flavors to change it up. You could try a chocolate cake with cherry Jello or a funfetti cake mix with blue raspberry Jello. The possibilities are endless! You can also use a strawberry sauce or any kind of fruit sauce in place of the Jello. There are other ways to frost your Jello poke cake too! You can mix a 3 oz box of any flavor Jello into the Cool Whip to flavor and color the frosting. You could also add prepared vanilla pudding whipped into the Cool Whip and then frost the cake. Can You Make a Gluten-Free Poke Cake? Yes! You can make a gluten-free poke cake using this recipe. Just replace the box cake mix with a gluten-free box cake mix like Betty Crocker gluten-free cake mix. Use fruit sauce in place of Jello if desired and top with fresh whipped topping.